Hello everyone, I apologize in advance if my remarks are not accurate I am not English. 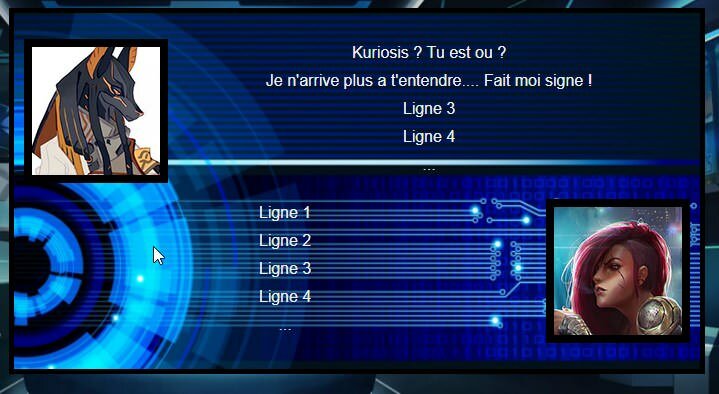 Kuriosis ? Tu est ou ? Je n'arrive plus a t'entendre.... Fait moi signe ! 1. that the syntax errors in your CSS were introduced by either the cut-and-pasting or by the Paste-bin site. 2. that the strange web-browser specific -webkit-slider, -moz-range, etc.. are real, although I couldn't find them on Google. 3. that you know you will need to remove the "file:///C:/Users/DrWhite/Desktop/DiscordiaGame/" part of your image URLs sometime before releasing a version of your story. 1. The center value of your float CSS properties is invalid, you would generally use text-align: center to horizontal align text. 2. By default your floating left & right images are going to effect any text that appears on any line the image covers. This is why the "Ligne 1" is being pushed to the right, because it is being effected by the left image which is has enough height to overlap the line that text is on. There are a number of ways you can correct this from: changing the display property of the div element containing second section of text from block to inline-block; to making the overall layout of both the top & bottom sections of text into a three panel layout. Which you do depends on the overall layout you're looking for, which you haven't stated. 1 : Do not hesitate to tell me syntax error, I am clearly not a pro in HTML & CSS but I try to get by. I always test it on 3 PCs and it still works. 2 : When I need lines of HTML or CSS code that I do not know, I look on the Internet, I found this, but I did not find to find it. As I said above, I'm far from an expert, I had more or less understood that the line was pushed because it was counted as a part of the image of the top. How to use window.requestAnimationFrame() in Twine 2 - Sugarcube? How can I center text in Sugarcube?